I made this quilt in 2003 and I still love it. The center is hand pieced - machine pieced stars, setting and border. I hand quilted it. Im rotating the quilts on dislay in the house. I hope you don't mind I share it again! Several years after I made it I was told there is a similar quilt, stitched in all silk fabrics in a museum. I will update this post when I get the museum name. 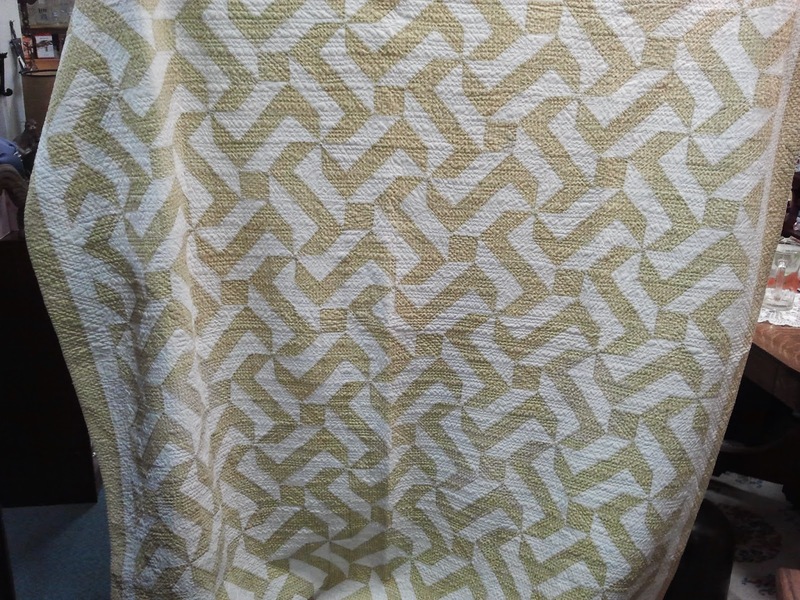 I've been pinning sleeves on quilts to hang them, and I see I have this one high in the center causing the bottom to wave. With the popularity of stars, I thought you might like to see some of my fabric combinations. I liked mixing some prints with various scale and design. This is the lowest left corner block - you might be able to see some of the hand quilting. Each block has four prints. This block has very low contrast with the setting blocks. I like reversing the placement of light and dark fabric. This block is on the outer edge next to the flying geese border. I have a new top in the frame. 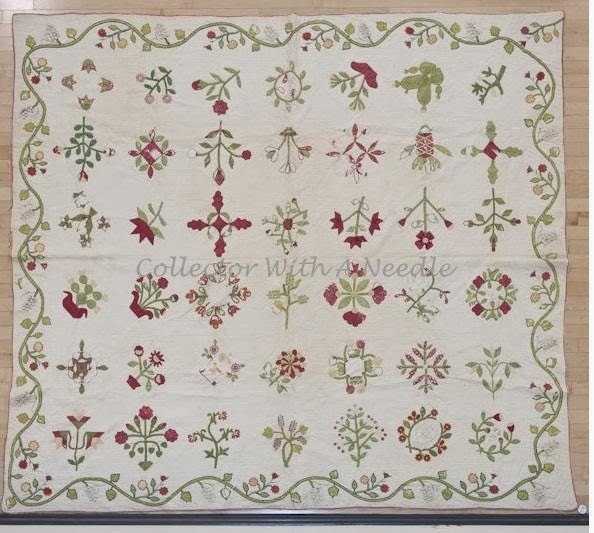 It is a reproduction of a circa 1850 quilt in our collection, Harrison Rose. The block is entirely appliqué, just like the original. I machine pieced the blocks together and did the half square triangles by machine. 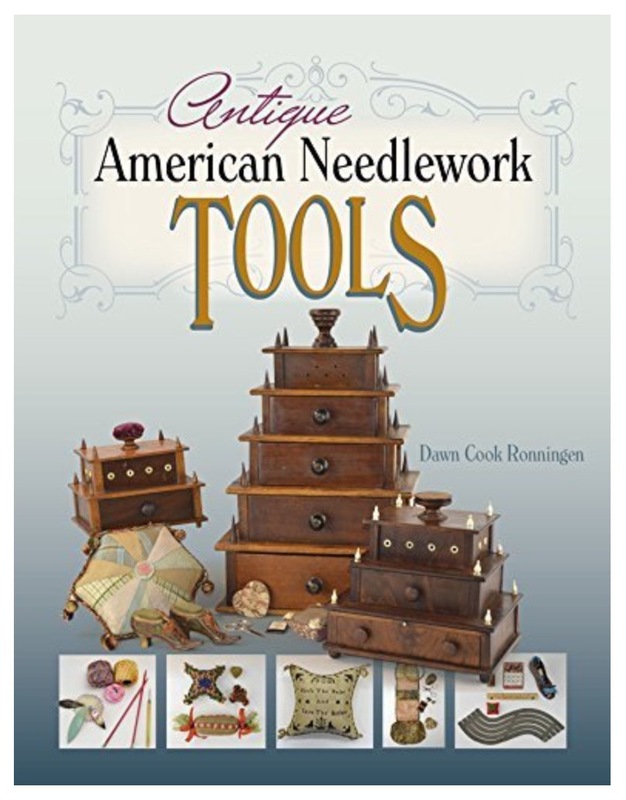 I am hand quilting it - just like our antique. See Nancy's Version HERE & HERE. She changed up her center colors and chose one of the pattern variations. There are several variations on the pattern. It also includes all of the quilting lines so you, or your quilter, can finish it just like the original. 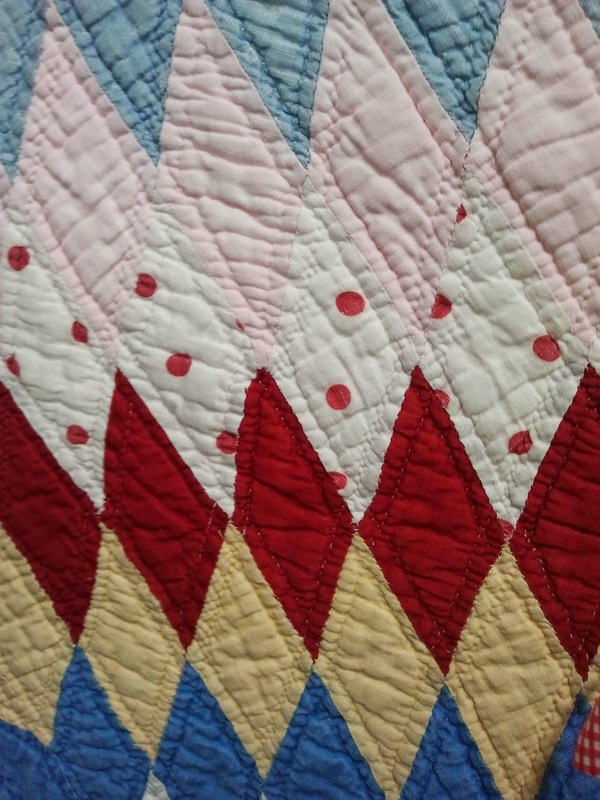 The quilting includes beautiful feathers, including the curves that make the corners turn so easily. There are double hearts, feathered wreathes and other assorted fillers. The fabrics in the original include orange, blue, yellow and or course - red and and green. 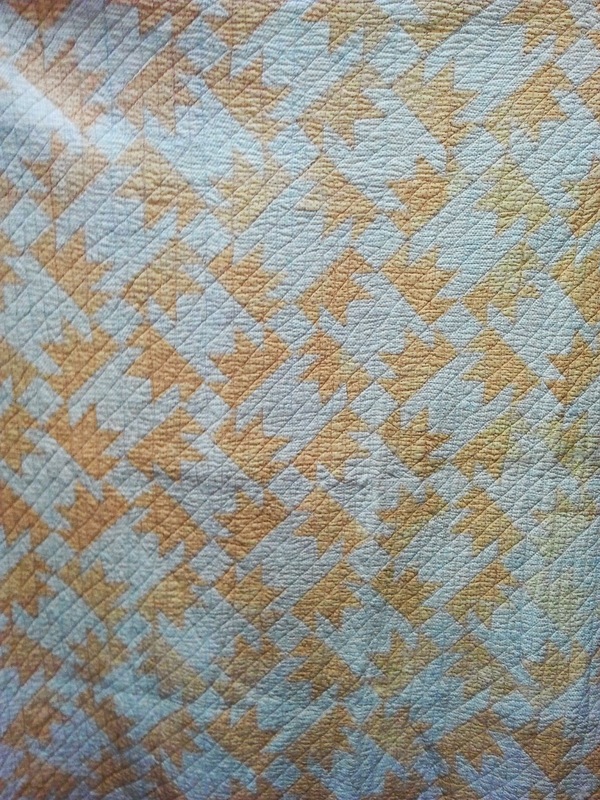 The original quilt is shown on the pattern cover. Other names for the Harrison Rose and similar variations are: Rose of Virginia, Pennsylvania Rose and Rosebud Patchwork. (Brackman Applique Encyclopedia pg. 105) The 'flower head' resembles a Cesar's Crown block. This is my antique Cesar's Crown top. It is entirely hand pieced - working with almost all bias edges. Our Harrison Rose pattern includes a full size pattern for this block if you want to give hand piecing a try. This stitcher did a lot of 'easing' on the seams. If you study it closely you will see the similarities and differences with the Harrison Rose flower. Here you can see the hand stitching from another Cesar's Crown block. Challenging seams in the outside setting fabric. I found the applique so straight forward. I'm sure for hand piecers this is also fairly simple to do. This variation (also from our collection) had some of the excess in the seam. 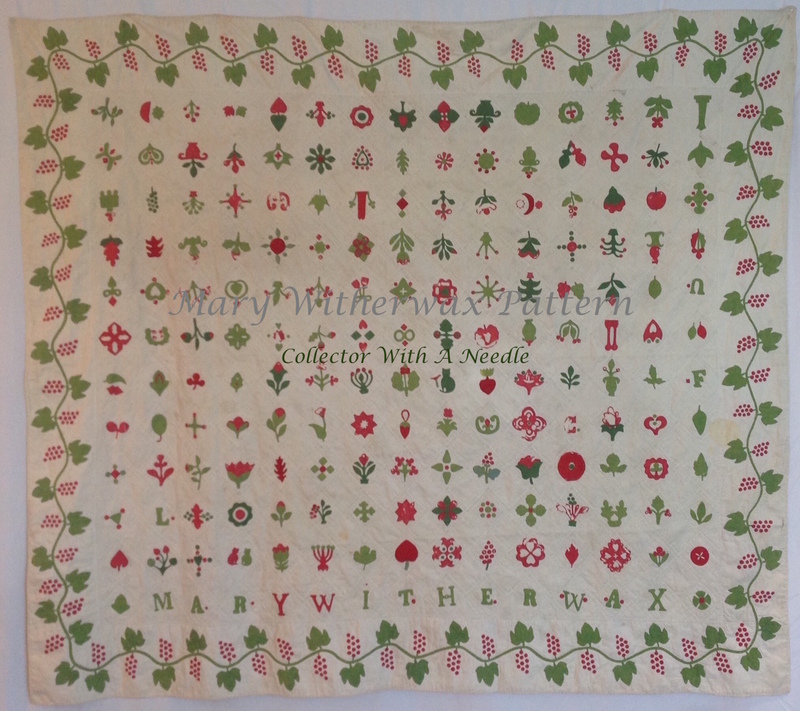 To finish the top, this quilter used an early quilt as you go method - circa 1890. Also note the slight change in the shapes of the block pieces. The excess was ignored and just quilted over. Straight line quilting in grids - posibly treadle quilted. Here is a block at the edge shown with the binding edge. Much simpler than Harrison Rose or Cesar's Crown quilts. It's much quirkier in person, with creative solutions to the piecing issues. This variation is from the 20th Century - also from out collection. See Maureen's HERE & HERE. Beautiful draped on her railing - and that striking border! This example is heavily quilted, just as beautiful on the back as it is on the front. Each block is done in only two colors/prints. 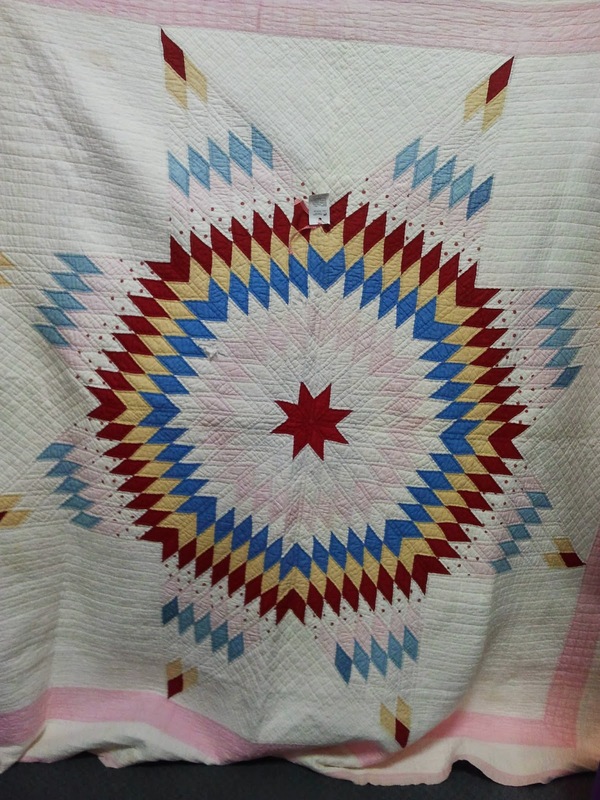 Kretsinger and Hall show and 1840 example - the most similar to our antique quilt. Other published examples include the Chicago Tribune, Cappers Weekly, and Mountain Mist. Further proof it is a timeless pattern! My quilt in the frame - loving feathers! I hope you enjoyed the examples and variations for Harrison Rose. Our pattern is filled with full sized options and variations so you can make a quilt special for you! My personal preference was the stem and basic leaf - most similar to our original. Stitch what makes you happy! Out roaming the antique shops and thought you might like to see some old quilts. This block has several names. It is in Brackman's Encyclopedia as #1393: Sail Boat Block (Mc Kim), West Wind (Nancy Page) with other variation if it had four HST's per side. Some of the California Gold print has lost it's original color color. The same shirting print was also used consistently through all of the blocks. This close up shows the machine quilting. Up close it's maybe not as effective. The binding is very worn, but a wonderful red. I think this gold print was reproduced by Moda a few years ago. The backing is a solid cream muslin type fabric. This is another classic, nice soft blue with solid white. It too has many names. This example is done in only two prints. Most similar to Brackman 1806d: Crown of Thorns (Cappers), Georgetoen Circle (Hall), Memory Wreath (Hall), Crown and Thorns (Ickis). I think I made one or two of these blocks fro a swap several years ago. I like this on point setting with solid sashing. 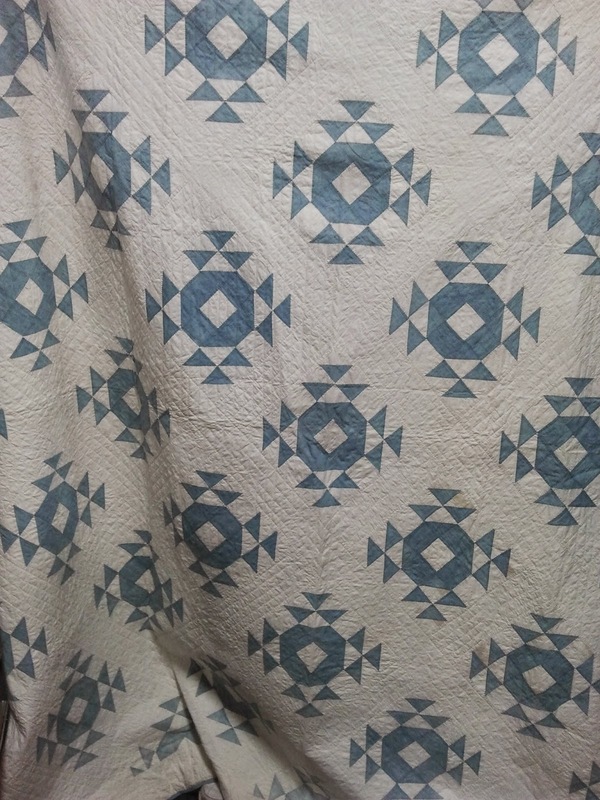 The quilt is bound in the blue, with a solid white backing. It is simply yet effectively hand quilted with very fine stitches. All straight lines, changing directions in the block. A well executed simple classic quilt! This one is simple, while looking complex. Unfortunately my phone photo does not show the wonderful yellow color of the print. Hand pieced and hand quilted. Two simple blocks - flying geese units and a square. The geese units alternate the placement of the light and dark fabrics. 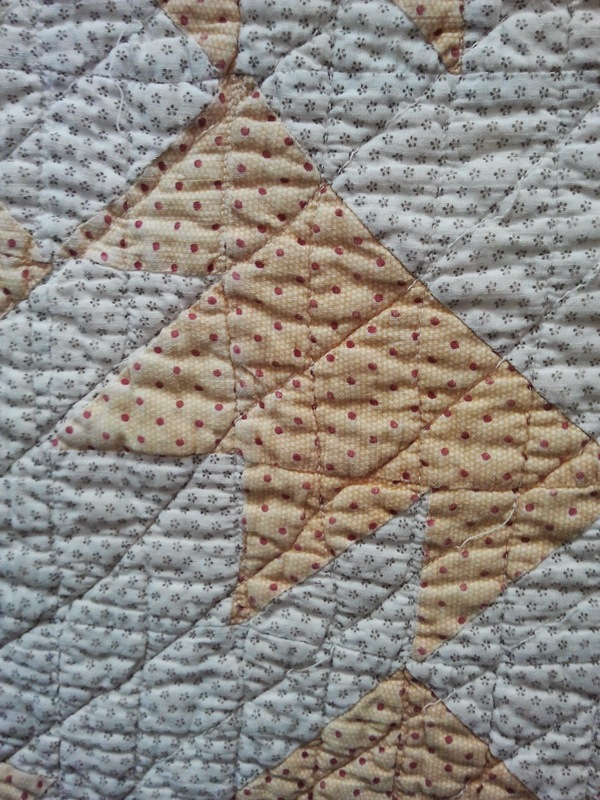 The straight line quilting makes it harder to see the piecing lines. Double narrow border finshes the edges. This simple block is in Brackman #3250: The X Quisite. I like the name but don't really 'see it' in the block. Several variations have also been published in Quilter's Newsletter. It's hard to see in my phone photo, but there are three prints in the block. Red print, solid white and a shirting dot. Perhaps not enough contrast in the three prints to be as effective as it might have otherwise been. The batting doesn't fill the quilt all the way to the binding. 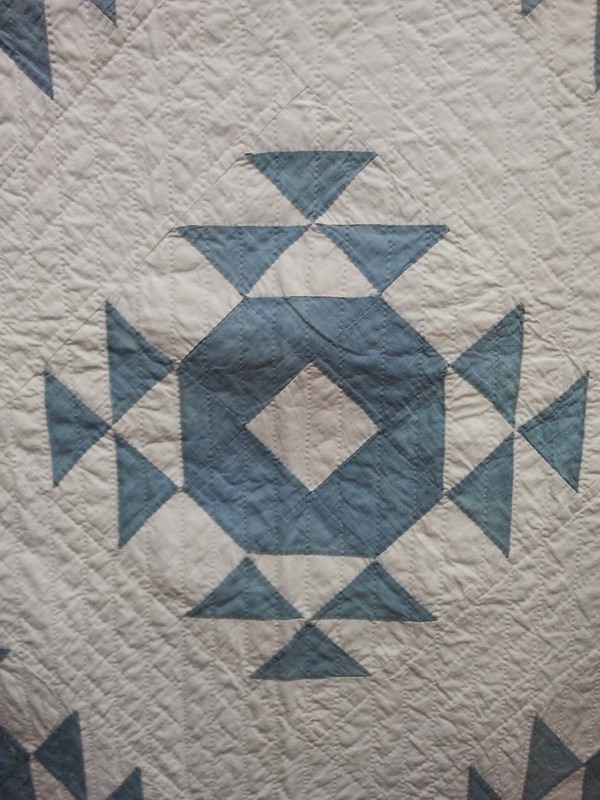 What would a nice selection of old quilts be without a star? I think one of the best things about this example is the red dot print. 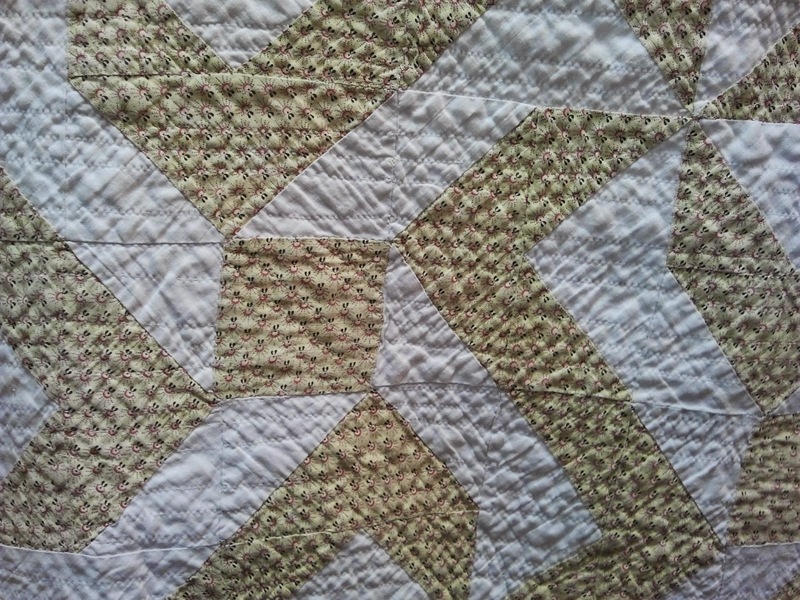 Utility quilted in the setting areas with straight line quilting. Maybe too much white? Those star tips really float. Double pink and white solid borders. 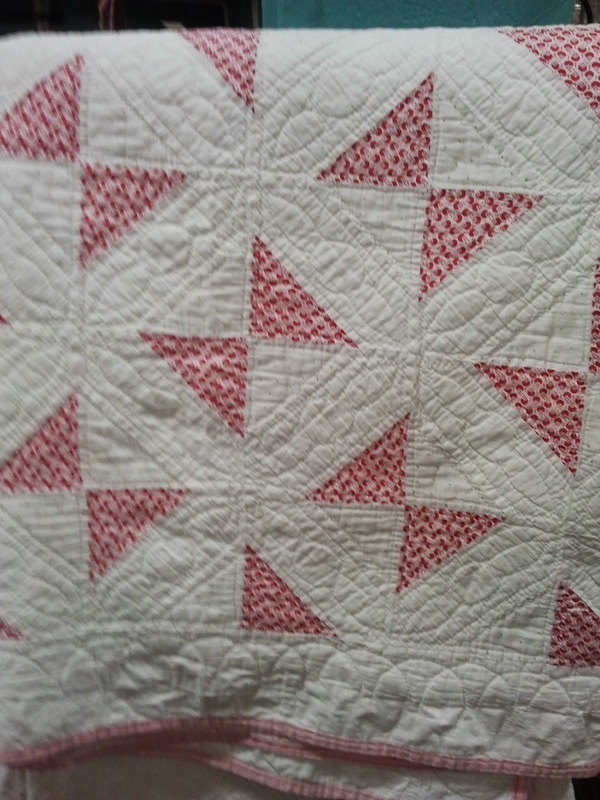 The star was also quilted in straight lines following the seams of the star diamonds. 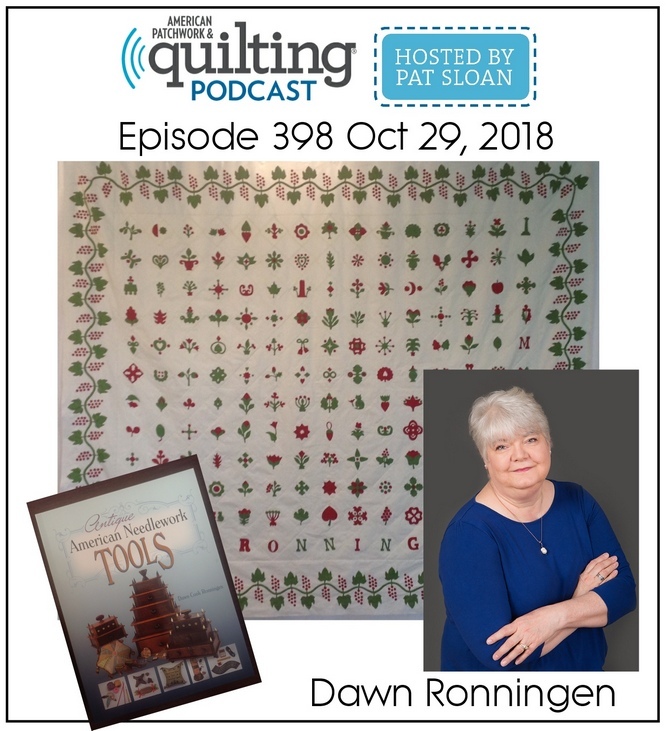 I hope you enjoyed the quilts and are finding some stitching time. Special thank you to my shopping partner and quilt holder. Are you wondering what I bought? Just enough to have to make everything fresh and white, but require shoveling. Our mild temperatures will have it all melted away tomorrow afternoon. 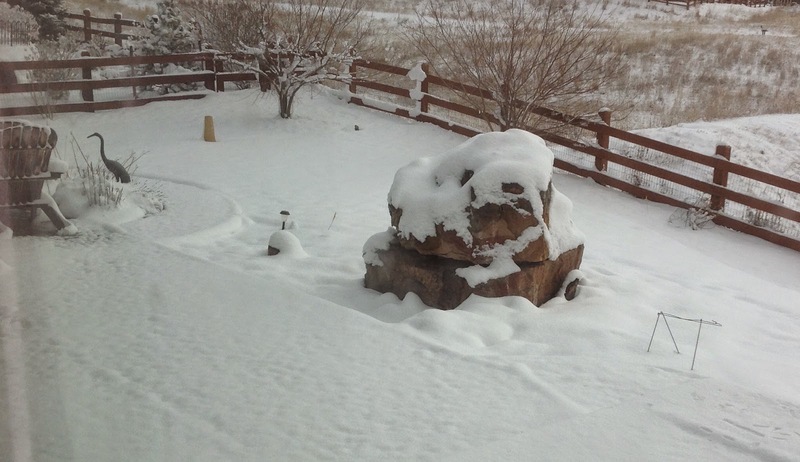 Under all the snow are peonies, tulips, lavender and lilies - all waiting for spring. In the meantime I'm doing a but of indoor window sill gardening. The hyacinth are an assortment of pink, white and purple. I didn't force the bulbs, rather bought them at the flower shop already sprouted. My master gardener friend works miracles with bulbs. She had a dedicated refrigerator for the process. Very impressive! The other kind of indoor gardening I've been doing is floral appliqué. This is the February block I had in process last year. You can get yours HERE. Month two also includes the quilting design for the alternate block. I have not been keeping up with my planned blog posts. We do have a new pattern that deserves it's own post. Next week I'll include pictures of my antique pieces, including the original this new pattern is based on. It is in the hand quilting frame and I'll share some of the border feathers I've completed. I hope you are finding some stitching time!